Oral cancer kills more people nationwide than either cervical or skin (melanoma) cancer, and only half of patients diagnosed will survive more than five years. One American dies every hour from oral cancer. The most common risk factors are tobacco use, frequent high quantity alcohol consumption, constant sunlight exposure, habitual cheek or lip biting, or poorly fitting dentures. Although most oral cancers are found in people who use tobacco and/or drink alcohol excessively, 25% of oral cancers occur in people who have no risk factors at all. We use the revolutionary VELscope Oral Cancer Screening technology to more accurately diagnose oral cancer. Learn more about VELscope here. Two follow-up tests can determine if a trouble spot is cancerous. A brush biopsy is a painless test performed on areas that look harmless or do not have a clear cause. This test can detect potentially dangerous cells in the early stages of the disease. A scalpel biopsy, which requires local anesthesia, is usually performed on suspicious areas. Remember to schedule regular checkups for everyone in your family. Two visits per year are recommended for general care. 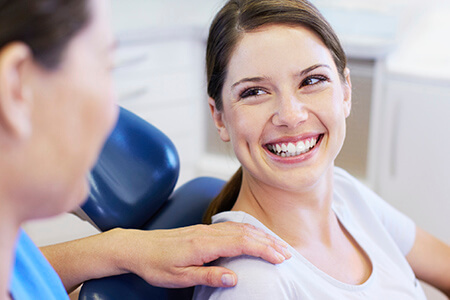 If, between visits, you notice any unusual changes in your mouth, call our office immediately. Together you and the Pasadena Family Dentistry team can fight and win the battle against oral cancer.